Additional buses and trains have been deployed for the convenience of commuters travelling to and from their homes during and after the Sinhala and Tamil New Year. The Road Development Authority (RDA) is also taking measures to minimise traffic congestion at entry and exit points along the Southern Expressway. Special transport arrangements made for the convenience of commuters will be in effect until April 22, officials stated. Sri Lanka Railways has deployed an additional 62 long distance special trains, Railways General Manager Dilanth Fernando told the Sunday Times. These trains will run until April 22. Over 120, 000 vehicles used the Southern Expressway on Thursday (11) alone, with most vehicles going south. Authorities were expecting even more vehicles on Friday and Saturday. RDA Chairman Nihal Sooriyaarachchi said they expect a similar number of vehicles to return to Colombo along the Southern Expressway from tomorrow. During this period last year, there were occasions where vehicles spent as much as 45 minutes at toll gates to exit the expressway due to long queues. Mr Sooriyaarachchi said measures are being taken to minimise delays and ensure there is no repeat of what occurred last year. Accordingly, instead of system generated tickets, officers at toll gates will be issuing printed tickets by hand to minimise delays. Authorities will also increase the number of toll gates at exit points depending on the level of traffic with some of the entry gates to be used as exit points where possible, the RDA chairman explained. If long queues are still forming at an exit point, measures will be taken to alert motorists through the electronic notice boards along the expressway. However, there may be occasions where the authorities will divert traffic to exit along the next closest exit point if there is congestion at a particular exit point, Mr Sooriyaarachchi further said. Motorists can do their part to help the authorities to minimise delays by bringing change with them to hand at the toll gate. The public can also call the expressway hotline on 1969 to check about traffic congestion along exit points, he said. There were 127 fatal accidents during the period from April 11 to April 20, last year, according to police. A total of 135 people lost their lives in these accidents. In order to minimise the number of fatal road accidents during this period, police are hoping to launch a special operation covering all police stations in the island, Police Headquarters stated. 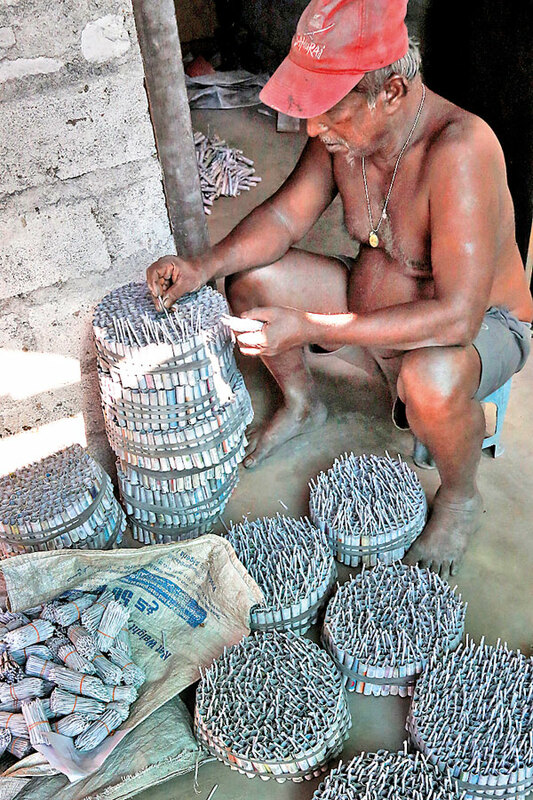 With the Sinhala and Tamil New Year dawning today, fire crackers are once again in demand. 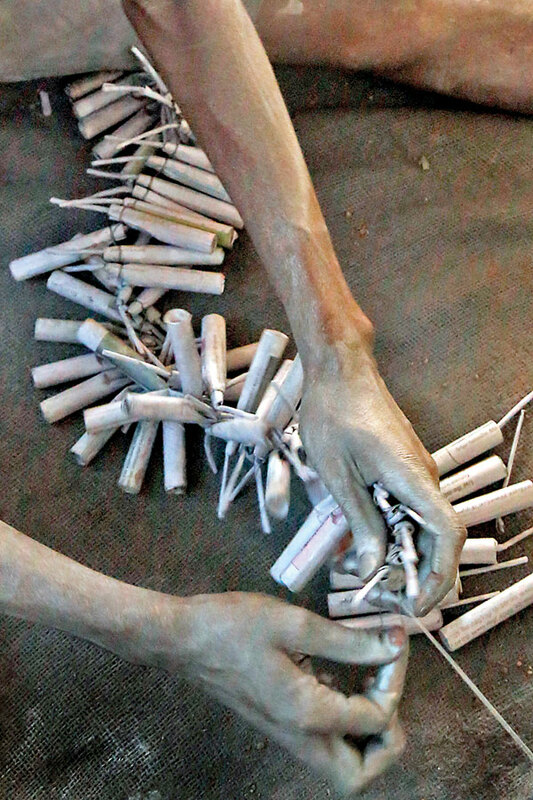 Here fire cracker makers are seen at work in Kimbulapitiya.